Basic how-to on using and publishing workshop content in Battlefleet Engineer. You can currently get new ship designs from the workshop. All content is free of charge. 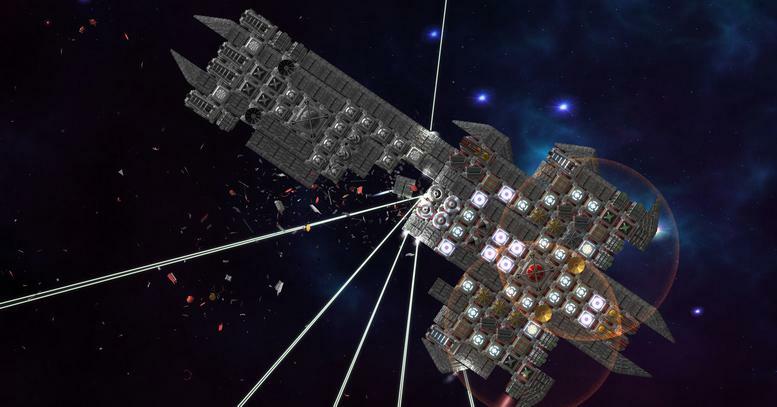 Open the Battlefleet Engineer workshop page in the Steam client, Steam overlay or web browser. You must be logged in and have the game in your Steam account to see the workshop. Subscribe to as many items as you want. Launch the game. You can also subscribe to more items while the game is running. The Steam client will download the subscribed items. The progress is shown in the Downloads view. Once downloaded, you should see the subscribed ship designs in the ship blueprint browser, which is available in multiple screens (free skirmish, fleet editor, battle editor). You can refresh the blueprint list by pressing the refresh button at the top right corner of the blueprint browser. Unsubscribing from items takes effect only when the game is not running. Note that item names and descriptions can be different in-game and in the workshop. You can share your own ship designs with the Steam community by publishing them to the Workshop from within the game. In-game the ship designs are called ship blueprints. Add ("purchase") any ship to the fleet editor from the ship blueprint browser. Edit the ship as you wish. Upon exiting the ship editing mode select "save as" from the dialog and then "new" and "save" to save as a new blueprint. Please also give the design a new name and short description. You should now see your design in the ship blueprint browser. You can only publish blueprints that have been created or edited by you. You can publish and update already published blueprints using the ship blueprint browser in the Fleet & ship editor. Go to Fleet & ship editor and open the ship blueprint browser. Select a blueprint saved by you. These are indicated by a person icon on the leftmost column. Press "Publish to Steam Workshop", select desired item visibility and press Publish. The game will save a temporary copy of the blueprint, render the preview image and upload those to Steam servers. This process may take from few seconds to a minute or so depending on your connection. The amount of data sent is about 1 megabyte. If the publishing succeeded the game will show you a link to the item that opens in your default web browser. When logged in to your Steam account you can edit the item title and description, moderate comments etc. It will take some time (maybe 15 minutes) for new items to appear for other users in the Steam Workshop. To update a design, its in-game name or description you can modify the blueprint, save and then publish it again. To do this you need to have the original blueprint, not the copy you get if you subscribe to your own item. Deleting a published blueprint doesn't delete its Workshop item. Workshop items can be deleted from the item's page in the Steam client, overlay or website. Protip: If you lose the workshop item ID reference in a blueprint you would want to update, it is possible to mend that by manually editing the blueprint file. The blueprints are saved under the game installation folder in "User Content\Blueprints" and use a human-readable XML-based format. Note that you must have agreed to the Steam Subscriber Agreement prior to publishing items.